Animal Sounds - Icebreakers, Icebreaker Ideas, Games, Activities! Find the other person in the room with the same animal as you by making the noise your assigned animal makes! Animal Sounds is a very simple icebreaker that gets people to act as animals to and find other of the same animals just by listening and making the specific animal sounds! This icebreaker is good for kids aged 6 and up. Unless folks are young at heart, it is not as ideal for adults above 25 years old due to its animal silliness! Animal Sounds is best for larger groups of 15+ people. Prepare the papers ahead of the game. Cut or tear the sheets of paper into small pieces. Write different types of animals that make distinctive sounds on each paper, making sure to duplicate each animal at least once. You should end up with lots of small papers with pairs of animals listed. Give each player a piece of paper with an animal listed. Make sure you only hand out an animal whose pair is given to someone else. Instruct players not to reveal what their animal is and to keep it a secret. Blindfold each player. Ask all the players to find their match, the other person with the same assigned animal as them, by only using the sounds which their animal makes. Players cannot speak, remove the blindfolds, or perform any actions other than moving around the room. Watch as the players try to find their matches. As different pairs of people find the correct match, check the papers they have to make sure they are actually the same animal. If not, send them back to the group to keep looking. Those who have found their pair should remove themselves from the game area to avoid further confusion. If time is a constraint, use a timer or stopwatch to make sure the game lasts for only a set amount of time. Make the game more interesting by choosing a wide variety of exotic animals and “common" animals that most people would know such as lions, baboons, blue whales, camels, elephants, and otherwise. The more variety, the more fun is had by players as they listen to the crazy noises going on around them! This is an icebreaker game that doesn’t necessarily have winners and losers. If you’d like to add a competitive edge to it you can rank players based on who finds their match first and give our rewards to the top 3 pairs. 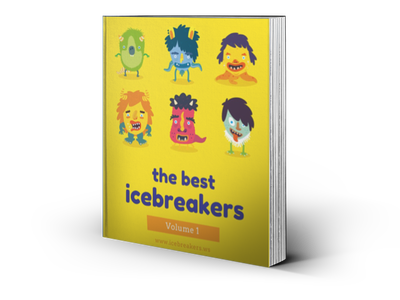 Best Skills Showdown Game - Icebreakers,Ideas, Games, Activities! Extreme Rock, Paper, Scissors - Icebreakers,Ideas, Games, Activities!